We left White Rock after our mandatory stop at the Overlook. The view was incredible, as always, maybe even more so this time because of the snow. I don't remember going to the Overlook as kid with snow on the ground. 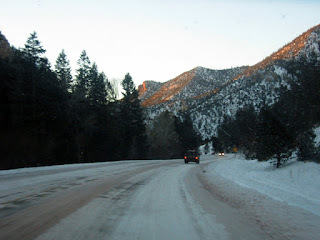 The drive to Enchanted Forest XC Ski Area was quite long. 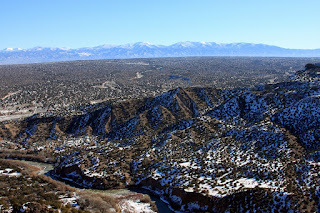 It took about an hour to get from Los Alamos to Taos where we made a pit stop and about another hour from there to Enchanted, which is 3 miles east of Red River. It looked worse than it was. 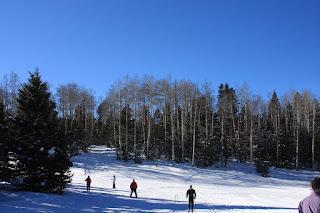 The ski base is actually about 200 yards from the highway and at about 9000 feet in altitude. 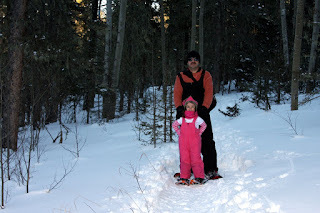 Since we don't have a 4 wheel drive vehicle to traverse this snow-filled road we planned to walk down a short hill and back up a steep hill to the ski base. Luckily, the actual owner of Enchanted was driving in as we started to walk and he gave us a lift, this was not the case as we left. When we arrived at the rental office we were told there was no charge for the kids...a very pleasant surprise. 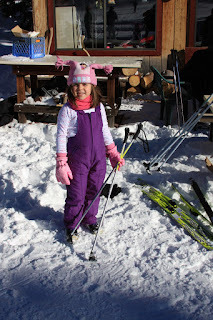 While getting our gear the employee helping us mentioned that most people dress too warm for XC skiing. Even though the temperature was only 20 degrees we decided to heed his advice. 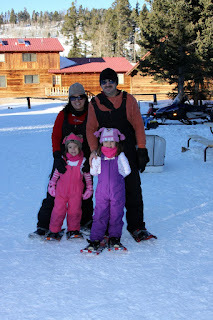 All of us had on awesome synthetic long underwear, jeans, long sleeve tops, ski bibs, neck warmers, tobaggans, gloves and jackets. We left the jackets in a locker at the rental office. 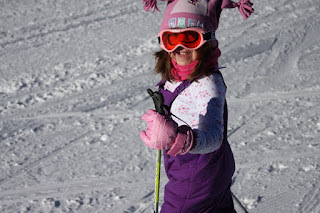 Here is M. on her first ski attempt...well done M. ! 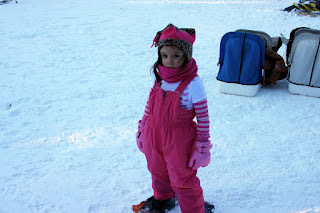 Here's A. about to ski...she had a blast ! 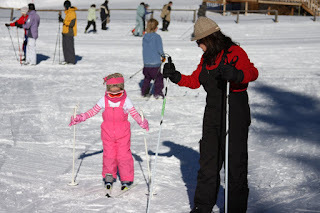 This was the first time girls and I have ever skied. 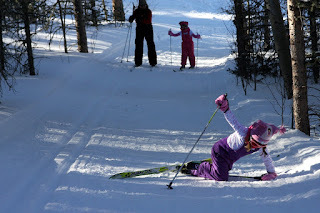 The girls did great....the biggest problem they had was going up inclines and getting up after falling. I actually, mysteriously, did not fall...so, getting up may have been more difficult than it seems. 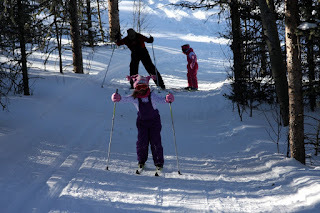 The trails here were very well groomed and they all had XC pistes (parallel grooves cut into the snow) which really helped the girls out. 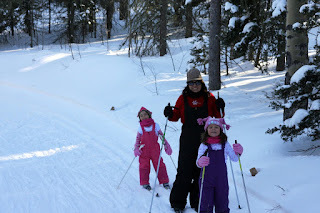 After skiing about 2 kilometers we decided to go back to the office and trade our skis in for snowshoes. They don't charge for this. We 'shoed the shortest loop they had since it was getting late (getting late in a ski area is 4pm). 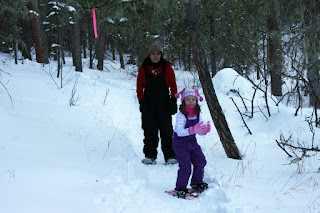 M started to complain...in fact, she really didn't want to snowshoe at all. I think she equated it with hiking in the snow.....which is exactly what it is. M has somewhat of an aversion to hiking since our Sedona hike earlier this summer. knee even with snowshoes on. Overall, everyone had a great time. And, I have to say the service here is great! I think this would be an incredible way to workout. Tonight we are staying in Taos. On the way back we stopped at Orlando's New Mexican Cafe for some chow. This place was very cramped and overly crowded. The host staff made things worse with their attitude. As I mentioned the place is very small but, I was bumped into no less than five times by the staff and not once did they say "sorry" or "excuse me." The food was very, very average. This place just didn't live up to the hype. 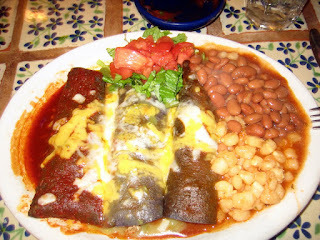 Dianna had the blue corn cheese enchiladas. She says they were kind of bland. I had the Los Colores which consists of a cheese, a chicken and a beef enchilada. The only item worth mentioning is the beef enchilada...it had very good flavor. They did skimp on the enchilada sauces, though. I also tried the chips and salsa. I say I tried it...I really should say is I purchased them. For some reason almost all Mexican (tex-mex) restaurants in Texas serve unlimited, complimentary chips and salsa while all Mexican (new-mex) restaurants in New Mexico charge for chips and salsa w/out refills. Anyways, the salsa was very good but the chips were store bought. The girls shared the kids quesadilla. This was a terrible attempt at a quesadilla. I could make a better quesadilla blindfolded, seriously. It almost had no flavor...it was like they oven baked a tortilla with some no-flavor cheese. Anyways, I recommend eating somewhere else while in Taos. Oh, almost forgot to mention. I made somewhat of a big mistake while booking the room in Taos. We are stuck in a smoking room; no, none of us smoke, in fact, we detest the smell of cigarette smoke. And, there has obviously been some heavy-duty smokers in this room before us. 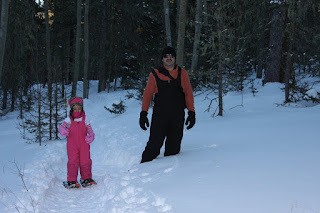 Not good.....but, they have nothing else available....it is a holiday week in Taos. I have my Hilton profile setup for non-smoking so I never realized I could end up with a smoking reservation. I will definitely check every future reservation.